Published: Jan. 30, 2014 at 12:32 p.m. 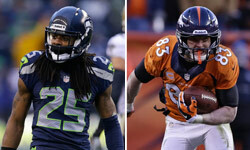 Updated: Feb. 1, 2014 at 03:22 p.m.
NEW YORK -- The Seattle Seahawks and San Francisco 49ers' rivalry already was great before the NFC Championship Game. One instant classic clash and one unforgettable postgame interview later, the NFC West rivalry has risen to another level. The best part: The teams genuinely don't like each other, something 49ers quarterback Colin Kaepernick made clear Thursday in New York when asked about Seahawks cornerback Richard Sherman. "His comments were ridiculous. If you have to tell people how good you are, then how good are you really?" Kaepernick told Bart Hubbuch of the New York Post. Kaepernick clearly took Sherman's "choke" sign personally. "Did that make you feel better about yourself? Then go ahead. Because I'm not worried about you," Kaepernick said. "He's afraid of our receivers, and that's something I'm looking forward to (exploiting) next year." Kaepernick, who also told Hubbuch he's rooting for the Denver Broncos on Sunday, even got into the "What if?" game, blaming himself for Sherman's famous tip that saved Seattle's Super Bowl chances. "If I throw that ball one foot farther, it's a touchdown and now you're the goat, Richard Sherman," Kaepernick said. You get the idea. We find the honesty fun and refreshing. Why wouldn't Kaepernick be upset? Joe Namath once mocked the opposing quarterback in the Super Bowl; this is nothing in comparison. Part of Kaepernick's charm is his edge. The more edginess we have between the 49ers and Seahawks, the better. Live from New York, it's "The Around The League Podcast!"